We are going, going, back, back, to Cali, Cali. The Cavaliers completed their Eastern Conference trek in a dominant fashion; reminiscent of Games 1 and 2, also in Boston, becoming the Eastern Conference Champs for the third consecutive year. Game 5 allowed the Cavaliers to break numerous records on their way to the Finals once again, now holding the league record with 13 straight victories in closeout games as a franchise in the playoffs lasting from 2009 to now. The first quarter was immediately a warning of what was to come for the home team on the brink of defeat, starting with a strong run early out getting to a double digit lead, eventually going up by 20 points within the first period alone, helped by Kevin Love's first quarter hot hand, that we've all come to grow used to firing away 8 straight points to open the game. The Cavaliers finished the opening quarter with a 16 point lead, up 43 - 27; with 43 being a franchise record in the playoffs for most points in any quarter. Within the first 24, the Celtics already looked frustrated and taken back by the Cavs strong showing, looking lethargic early and not hustling on defense, as well as clear agitation on both players and coaches, with Gerald Green putting the Cavaliers into bonus only 2 minutes into the second quarter, and then giving away a technical, to go with it, blowing the early lead to 21. Foul trouble and easy free throws remained an issue for the guys in green, with the Cavaliers shooting a terrific 20 - 24 from the charity stripe, with only Lebron and JR missing (3 and 1 respectively). Unlike the rest of this series, The Cavaliers were given a huge boost off the bench, with the reserves scoring 49 points this game. A massive jump between the measly 7 and 9 points from the bench in Game 3 and Game 4, respectively. Deron Williams came out firing in the 2nd, going for 9 straight points, totalling 14 shooting 5/6 from the field. Richard Jefferson, Kyle Korver and Channing Frye all added some great efficiency and scoring totalling 22 between the three of them, and hitting 5 of 12 from deep. The Celtics also had a lot of points off the bench, but their starters were not exceptional, with the team as a whole shooting 43% in comparison to the Cavaliers superior 56% Marcus Smart and Kelly Olynyk who've had terrific games these playoffs struggled mightily going a combined 2 of 15. After breaking their franchise half-time record in the playoffs with 75 points, and an 18 point lead, Lebron decided to put himself in the history books as well tonight, passing Michael Jeffrey Jordan as the leading playoff scorer in NBA history and went on a three point barrage to put an even larger gap between himself and The GOAT. Lebron took a good few games more than the Chicago legend, but with him still playing at a premier level, it's highly likely he has at the least a good few more years in the league and dominating the playoffs, putting an even bigger gap between himself and 2nd place, leading a record that is unlikely to be broken anytime soon. Kyrie Irving also decided in the third quarter ,that he didn't want King James getting all the attention, so he went on a run, similar to Game 4, scoring 11 straight points including 3 difficult contested threes, shooting with a real hot hand, leading the team to a 34 - 17 third quarter rout. Lebron James also had a hot hand from deep and ended up finishing the game only one three away from Reggie Miller in 2nd place in playoff history for made threes, yet a long way behind his former teammate Ray Allen. By the fourth quarter, we sat all the starters ensuring their health and preventing any possible injuries, letting the deep bench players to get a run in, and finished the game still maintaining an overwhelming 33 point lead and 135 points (Cavaliers franchise record for most points in a playoff game) to finish the series in Boston Garden. Dahntay Jones and veteran James Jones; on the way to his 7th straight NBA Finals, put in solid efforts in the 4th, with Jones throwing the hammer down on a putback slam we haven't seen from him in years. With such a lead, Lebron played a playoff low 34 minutes, yet still put up an MVP stat line of 35 points (13-18, 4-7 from 3, 5-8 ft) , 8 assists, 8 rebounds, 3 steals, 1 block and only 2 turnovers. Love added a double double with 15 and 11, and Kyrie finished on 24 shooting 60%. The Celtics played admirably, but their playmaking and overall ball movement was not up to the standard they had shown in their last few games, only resulting in 20 assists and overall mediocre slow movement, leaving the team forced to take imperfect shots, disappointing the home fans and aggravating the players as well. Late in the 4th, Jaylen Brown took a rough fall, and the Cavaliers on the court came over to offer him a hand and help him up, only for their hands to be swatted away and them to look back in shock and awe. A similar incident occurred moments later when Tristan Thompson attempted to help up Amir Johnson while the Cavaliers were running in transition, and was pushed away once again. 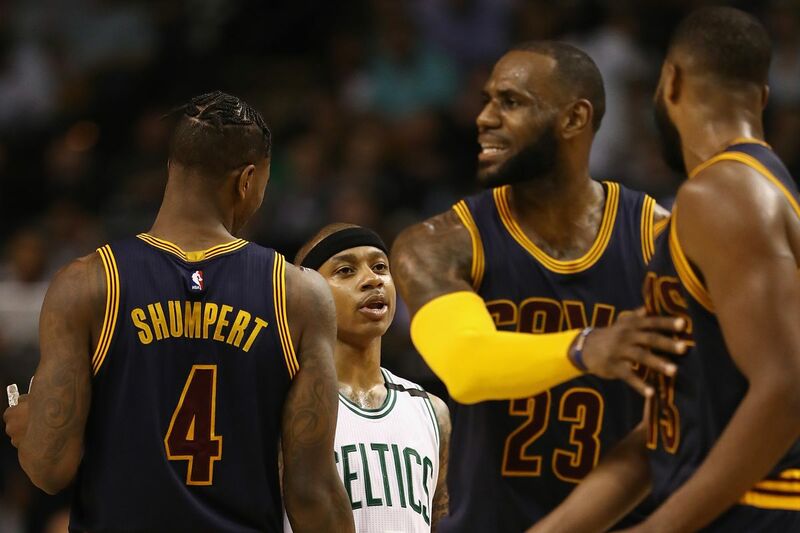 The team was clearly frustrated and agitated, yet it was a different sight than what the Cavs had been used to. Even going back to the Finals in 2016, there were numerous possessions both after a whistle and in play, where a Cavaliers player helped up a Warrior, and vice versa. I'd heard numerous critics of these actions from journalists last year, stating that it wasn't in the spirit of the competition, yet it clearly seemed welcome in that series and there was no lack of competitive spirit, just good sportsmanship; which was unfortunately lacking in today's Game 5. Regardless, Lebron James has led his Cavaliers back to the promised land of the NBA Finals and only 4 games away from back-to-back championships in a once cursed city. James and Jones have both earned themselves a ticket to their 7th straight finals, the only players to achieve such a feat since; ironically, the core Celtics players of the 60's. Aside from one shock defeat in Game 3, the Cavaliers were utterly dominant against the Celtics and maintained a decisive lead throughout their 4 victories. In the 3 games that were played in Boston, the Celtics did not lead for a single possession, with only one tie occuring in those three games, early in today's game with the score tied at 3 - 3. Aside from that, the Celtics were losing for all 144 minutes played in Boston. Dominance. The Wine and Gold have been victorious through the East, with a record of 12 - 1. They now have a week off to prepare for the NBA leading Golden State Warriors for a third year straight, looking for a repeat and to hold off the All NBA loaded roster hungry for vengeance.